On December 19 at 3AM, PNN rthe Israeli military raided and ransacked Ahed’s home, arresting her along with her mother and cousin, and charged Ahed with 12 criminal counts, including assault and incitement. During a protest, Ahed’s 14-year-old cousin was shot in the head at close range by an Israeli soldier. Israeli soldiers then invaded the Tamimi family’s home and threatened the entire family. Ahed demanded the soldiers leave . After they refused, the unarmed Ahed slapped one of the heavily armed soldiers. It is clear from a video that later went viral, Ahed posed no actual threat to these soldiers. The first billboard compares the apartheid regime in Israel with the former apartheid regime in South Africa. 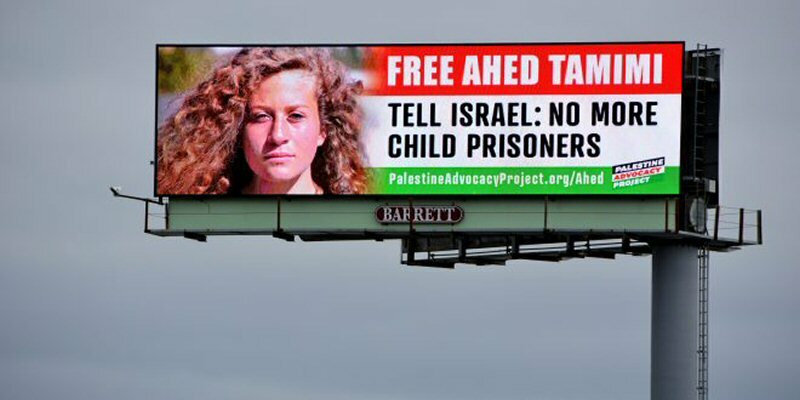 The text strikes through the name of Nelson Mandela and instead proposes Ahed Tamimi just below. Both Nelson Mandela (imprisoned for 27 years by South Africa’s apartheid government) and Ahed symbolize courageous resistance to a repressive government and apartheid systems. Ahed, who spent her 17th birthday in military prison, was arrested without charge and can be held up to 6 month with no due process rights, like so many other Palestinians. When she does go to trial, she will be in a court that has a 99.74% percent conviction rate for Palestinians. Israel’s settlers operate with virtual impunity in the Occupied West Bank. The second billboard picks up the focus on freeing the child prisoners in Israeli military prisons. According to Defense for Children International-Palestine, “Israel has the dubious distinction of being the only country in the world that systematically prosecutes an estimated 500 to 700 children each year in military courts lacking fundamental fair trial rights”.